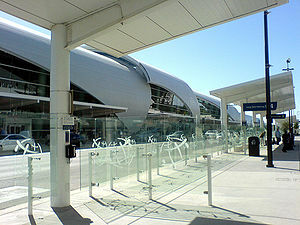 Also known as Mineta San Jose Airport, named after former Congressman and Secretary of Transportation Norm Mineta. Free VTA 10 Airport Flyer bus connects with light rail at Metro/Airport Station. When taking the bus from the airport to light rail, look at the headsign to make sure that the bus says "Metro/Airport." 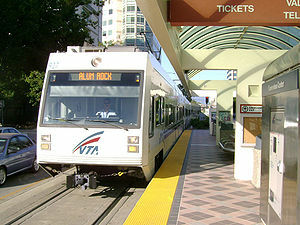 VTA Light Rail serves Downtown San Jose, South San Jose, Campbell, Mountain View and Milpitas. Free long term airport parking is available at selected light rail stations. Free VTA 10 Airport Flyer bus connects with Caltrain, Altamont Corridor Express (ACE), and Amtrak Capitol Corridor trains at Santa Clara Station. At the airport, only board the bus with the headsign that says "Santa Clara Caltrain." Caltrain serves San Francisco and cities on the Peninsula. Limited service continues south from San Jose to Gilroy. ACE trains serves the Tri-Valley, Tracy, and Stockton. Capitol Corridor trains serves the East Bay and continues to Sacramento. Highway 17 Express, and Monterey-Salinas Transit buses stop at San Jose Diridon Station. From there, take VTA Light Rail line to Metro/Airport Station and transfer to VTA 10 Airport Flyer. From BART, exit at Millbrae Station, transfer to Caltrain and get off at Santa Clara Station. VTA 10 Airport Flyer goes from Santa Clara Caltrain to the terminals. Bike racks are located by the garages at Terminal A and B. This page was last edited on 20 March 2017, at 22:14.